Keeping children engaged while learning essential skills can be difficult. There is a fine line between learning being fun and boring. When learning can be incorporated into a game, everyone wins. Start improving your child's multiplication skills with Multiplication Slam. Multiplication Slam by Educational Insights is the fast paced game that reinforces the memorization of multiplication tables. When it comes to learning multiplication, the basic 1-9 numbers patterns need to be instantly recognizable. This knowledge is solidified through practice and repetition. While sitting at a table with multiplication tables memorizing numbers can get the job done, it can be boring for kids. Minds can wander and there is little way to test what is being learning. 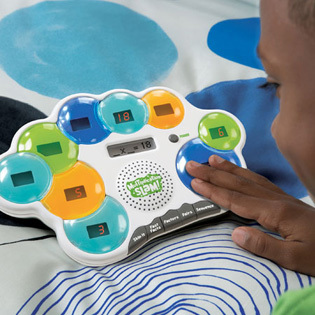 By making the questions into a fast paced game, Multiplication Slam can put the answers on your child's finger tips. The game is simple to play. First, read the problem. Second, scan the possible answers. Finally, slam the correct answer on the playing board. Players must move quickly through the game. Scores are determined not only by correct answers but by the time it takes to answer. The faster the correct answer gains a player more points. Don't worry about kids becoming discouraged or not learning the correct concepts. Problems that are missed are recycled into the game. The problems will reappear until they are answered correctly. There is less chance of learning an incorrect answer. As kids master the game, the problems and pace becomes more difficult. The goal is to make the user know the answers in an instant. Kids are engaged with fun sound effects and flashing lights to make the game fun, not just rout memorization. My kids have been playing Multiplication Slam and like the game because it is interactive. Since multiplication tables and flash cards have been deemed boring, the kids will sit for 15-20 minutes at a time playing this game. Plus, this game proved a good distraction on a recent road trip. Instead of mindlessly playing other electronic games, the kids put their math skills to the test. Multiplication Slam can be purchased online at Educational Insights website or select retailers. The game retails for $39.99. It requires 3 AA batteries. This game is recommended for grades 3 and higher, but if your child is learning multiplication at a different grade level or age bracket, she can use it. Turn multiplication into a fast, entertaining game with Multiplication Slam from Educational Insights. We need Multiplication slam! I'm afraid my 3rd graders' math skills have gone down this summer. This would be a fun way to refresh for school. I really adore the idea of learning while playing. This game is a great option! I'm going to share this with my sister to pass on to my nephew! I love educational toys!